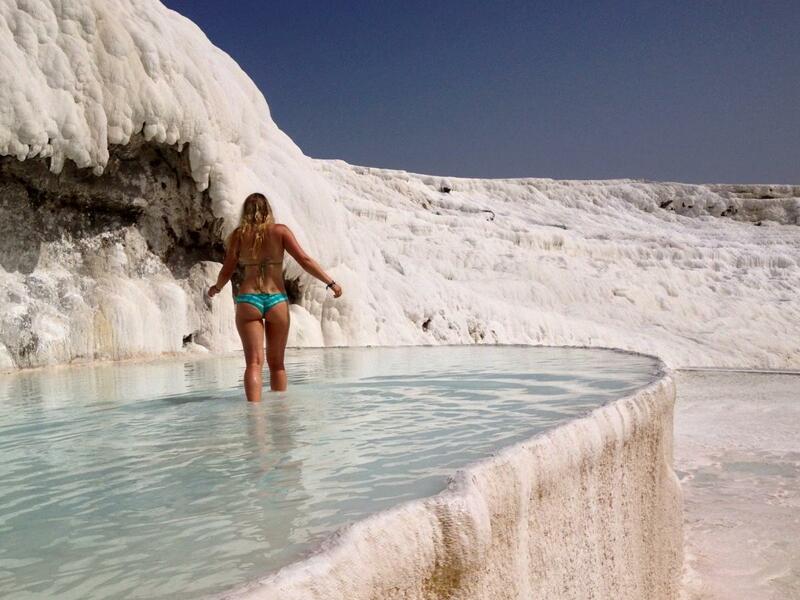 The surreal, brilliant white travertine terraces and warm, limpid pools of Pamukkale hang, like the petrified cascade of a mighty waterfall, from the rim of a steep valley side in Turkey’s picturesque southwest. 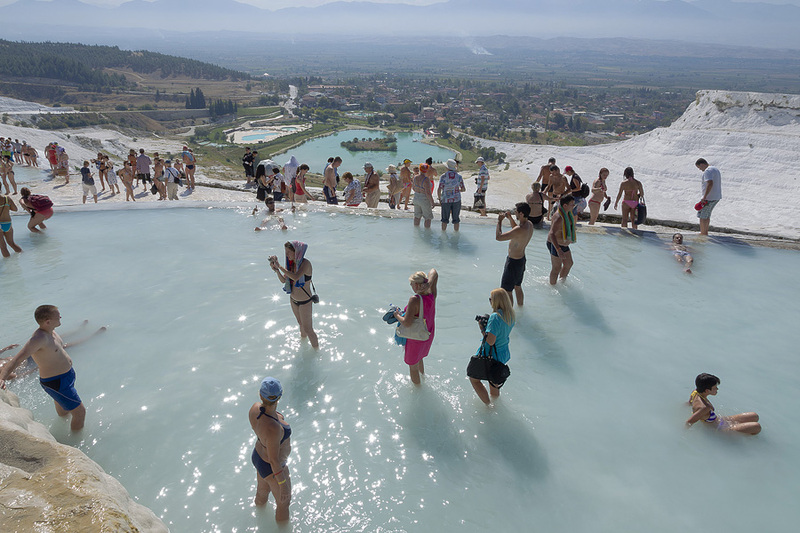 Truly spectacular in its own right, the geological phenomenon that is Pamukkale, literally "Cotton Castle" in Turkish, is also the site of the remarkably well-preserved ruins of the Greek-Roman city of Hierapolis. With such a unique combination of natural and man-made wonders it’s little wonder that Pamukkale-Hierapolis has been made a Unesco World Heritage site. With over two million visitors annually, it is also Turkey’s single most visited attraction. Nowhere else in the world can visitors enjoy exploring both picturesque travertine formations, built up over the millennia from limestone deposited by the abundant hot springs, and the colonnaded streets, temples, bath houses, necropolis and theatre of the remains of an idyllically located Greek-Roman spa city, Hierapolis. You can even bathe, as the Romans once did, in a picturesque pool filled with warm (around 36C), mineral rich waters and swim amongst submerged columns of great antiquity. The best way to approach the ancient site is to walk up through the formations on the travertine path, starting at the south gate to the site. You are not permitted to wear shoes or even sandals to do this (to prevent eroding or staining the delicate calcite deposits) so bring your footwear (and everything else you’ll need for exploring the ancient ruins) along in a bag. Wearing swimwear allows you to splash in the warm, aquamarine pools en-route, and later swim in the antique pool at the top of the terracing. Allow the whole day to make the most of the travertines, pools and remains - bring a picnic lunch (and plenty of water/suncream etc in mid-summer). Recommended accommodation in pleasant Pamukkale village includes Melrose Hotel (melrosehousehotel.com) and the dearer Hotel Hal-Tur (haltur.net).